Raising Two Cocker Puppies Is Going To Be Harder Than You Think! I'm thinking of getting two cocker spaniel puppies - am I crazy? We just put a deposit on 2 cocker pups. Can't anyone here help me figure out if this is a good or a bad idea? I can certainly see the attraction but I would warn against it unless you are fiercely determined and fully prepared for what you are about to face! To be honest with you, I'm surprised that the breeder has agreed to let two puppies from the same litter go to one family. It's very rare that this happens. You would be forgiven for thinking that having two puppies will be twice the fun of having one puppy - no so. Raising two puppies at the same time can bring many problems and unless you are fully prepared you could fail miserably and end up tearing your hair out. I would recommend you read this article entitled, 'Two Puppies Will Be Twice The Fun Right? Wrong!'. It will explain to you why it's not a good idea to raise two puppies at the same time, but if you are really determined to do so, it also gives you advice on how resolve the problems you are likely to encounter. Trust me it's not for the faint-hearted! If you do decide to raise two puppies at the same time, I wish you lots of luck. You can upload your favorite pictures of your dogs here. Whatever you decide Denise, I wish you lot of luck and happy times with your cocker spaniel pup(s)! Comments for Buying Two Cocker Puppies! I took two puppies from the same litter, 2 boys, and was afraid they might fight with one another so I had them both fixed! They have never been cross with each other, but one is definitely dominant in certain areas while the other 'gives in' all the time. Obedience training was a challenge but eventually they became very well behaved. Now 8 years old, they have been a pleasure to have in the family. Previously I had a single cocker who suffered separation anxiety by howling when we left the house. These two brothers seem to be totally fine when left alone. Maybe they keep each other company.... Who knows what they do when I'm not there! Be prepared for some hard times the early days but as they get older, it all seems to settle down! Raising two puppies is always harder than you think. 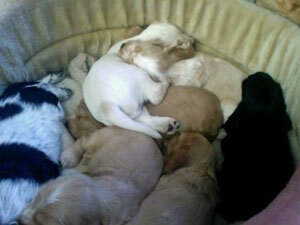 One puppy - problems, two puppies - a huge amount of problems! Raising Two Puppies Is Hard! I myself have raised two cocker spaniels, a brother and a sister, since they were 6 weeks old. I must say that this is hard work, but there also can be rewards too! I taught Scrappy (my male) things and eventually Pieper (my female) followed in his footsteps and visa versa too. You have to give you full undivided attention when raising two puppies of any kind. If you have a full time job I would say this is a bad idea. I have been fortunate enough to be not working when I got my two. But after I got through the puppy stage my two cockers gave me as much as I gave to them. I would never have traded them for the world - they are my best friends. If you have lots of patience, love and understanding of the pups and no full time job I would say go for it...I'm so glad that I made the right choice in getting this brother and sister. But word of advice if it's a brother and a sister, I would get one fixed!